A three-and-a-half- year trial ended this month in Bolivia with justice for a little girl named Mona. * The trial lasted more than half the length of Mona’s lifetime, and the verdict closes a very painful chapter for her family. When Mona was just 3 years old, she was raped by her older half-brother. Mona’s mother knew she had to seek justice for her daughter—even though the odds are stacked against impoverished families like hers. In Bolivia, you are more likely to die from slipping in the shower than going to jail for sexually abusing a child. A criminal investigator from Bolivia’s national police unit brought the case to IJM. It was clear Mona and her mother needed expert legal support, plus therapy to help move forward from trauma suffered at such a young age. IJM assisted police to investigate and conduct a crime scene inspection. Working with the public prosecutor, IJM lawyers helped gather evidence by recording statements from Mona’s mother and obtaining psychological reports. 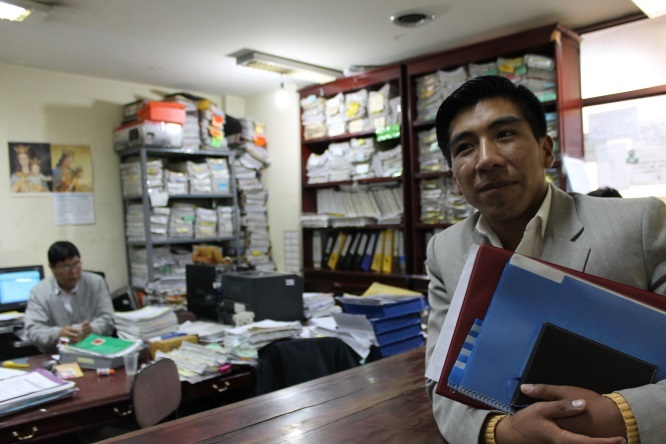 An IJM Bolivia paralegal stands in the prosecutor’s office; he helped gather and prepare critical paperwork and records used as evidence in this case. Juries in Bolivia are made up of five people—two professional judges, and three jurors who are called “citizen judges.” One of the biggest challenges is simply getting all parties physically in the room so a hearing can proceed. There are no legal consequences for jurors who fail to report for duty, and even judges are often double-booked or fail to show up. Hearings are routinely postponed, and trials can take years to finish. On October 9, 2014, Mona’s IJM attorney, Vanessa Saravia, and her mother came to the courthouse for the last time. A judge declared that Mona’s half-brother was convicted and sentenced to 20 years in prison, without parole. Vanessa said she had to restate the verdict when they went outside; Mona’s mother barely dared to believe her country’s laws had been enforced for her small daughter. Mona is now 7 years old and attending school. She has a new future ahead of her. You have a voice. Use it to advocate for children like Mona. One click to learn more.